Sometimes you stumble across a portfolio where the artist only has a couple of comic based pieces, other times there can be just one work so brilliant, you'd risk being stoned to death by fellow art lovers for putting something else beside it. 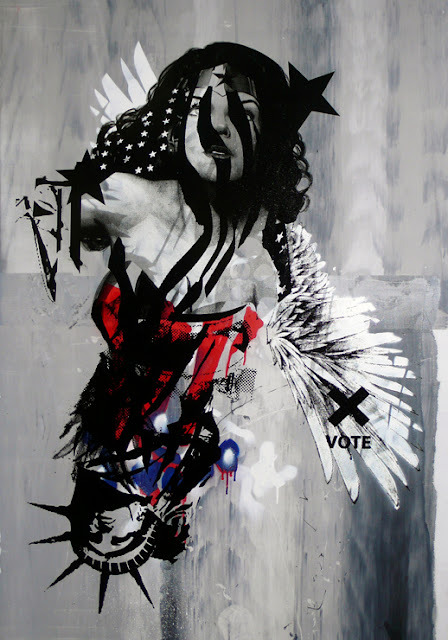 These are Random Works of Wow, and illustrating the point this week is artist 'MissBugs' with Wonder Woman in a piece titled The Wonderful Vote. I really love this one. It makes you stop and think. The parts are recognisable but not, and the colours just highlight it enough to be a powerful piece. Personally, on voting day, I can't be around anyone who doesn't vote. It really ticks me off. To think some ignore a freedom many in this world still don't have, yet alone one so many of our predecessors fought to obtain and maintain because they want to do other important things like play Farmville, defines many words. None of them positive. This piece by contrast, is positive plus. What do you think? Sound off below or to view more of MissBugs' artistic wizardry, click the jump.